Have you ever been out to eat or in a hotel and yearned for a great water? I’m constantly looking for a “thirst quencher” without compromising healthy sustainable living. I’m not a fan of the plastic containers or lugging around glass. What I discovered was that the KOPU Water is sourced from an aquifer way below the earth’s surface in a remote area in New Zealand. Maritime transport assures than energy/fuel efficiency is top priority. After our friendly meeting … I brought my KOPU Sparkliing Water pack home and took it for a taste test. The blue aluminum container is lightweight and recyclable. I popped open the wide mouth screw top and started pouring into my glass. If I wanted to save after opening, I could seal back the top and keep the bubbles trapped. Results? Wow, I loved it – just like a good champaign! There is no comparison to other sparkling water options. Hands down KOPU has them beat. 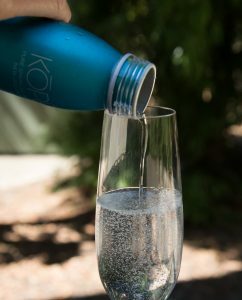 I hope to see KOPU Sparkling Water in more restaurants and shops as an alternative to the less adequate water products. As of this week, Kopu Water is available through eCommerce.